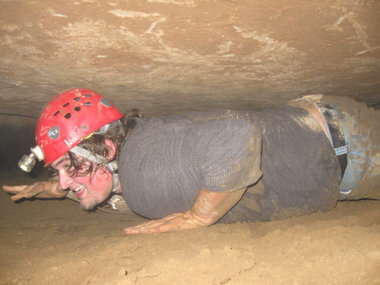 If you think "spelunking" is the proper term for exploring caves, think again. Those who explore caves with proper safety equipment and precautions refer to themselves as "cavers." To a caver, a spelunker is someone who thinks proper caving gear is a six-pack and a handheld flashlight. 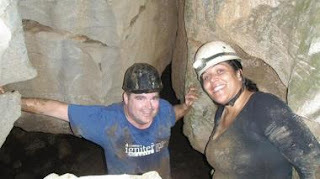 Cavers rescuespelunkers. 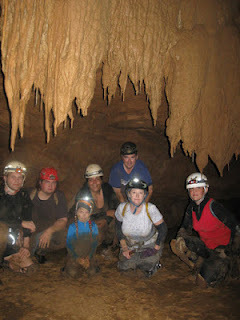 Alabamians know a thing or two about caving. First off, we have the headquarters of the National Speleological Society (NSS) located right here in Huntsville. Local NSS groups, called "Grottos," include Birmingham and, of course, Huntsville. Second, we have caves. A lot of caves. According to the Alabama Cave Survey, which maps Alabama caves, we have well over 4,000 of them! In fact, south-central Tennessee, northAlabama, and northwest Georgia—better known to cavers as TAG—is a real caving hotspot. If you've only experienced Alabama's commercially-operated caves (DeSoto Caverns, Sequoyah Caverns), one of our State Parks (Cathedral Caverns, Rickwood Caverns), or even Russell Cave National Monument you may think of caves as having large, dry chambers and lots of walking passage. But cavers experience caves in their natural state, where wet, muddy crawls and deep pits abound. You should only experience "wild" caves with experienced cavers: inexperienced spelunking can get you trapped—or killed. Another reason to only explore caves with cavers is to protect the caves themselves. It may seem strange to think about protecting holes in rocks, but many caves are filled with exotic and even delicate natural stone sculptures formed slowly over hundreds of thousands of years. Rainfall dissolves dead leaves and other organic surface material, becoming slightly acidic. As this acidic water travels underground, it slowly dissolves the limestone in which most Alabama caves are formed. This not only leaves the holes that are remnants of underground streams and lakes—our caves themselves—but secondary seepages carrying dissolved minerals then decorate these hollow spaces with "flowstone" formations: stalactites, stalagmites, columns, and draperies. Speleothemsis the general caver term for flowstone formations. You can tell the pointy stalactites and stalagmites apart with this common commercial cave tour guide wisdom: A stalactite clings tightly to the ceiling, while a stalagmite might reach the ceiling if it grows tall enough. When stalactites and stalagmites meet, they form a column. Commercial tour guides love to point out bacon-like draperies and flowstone formations that supposedly resemble everything from sharks to U.S. presidents. It is easy to let one's imagination run wild in caves! Alabamians have a long history with caves, too. Ancient Alabamians inhabited Russell Cave some 10,000 years ago. Gunpowder mined from saltpeter (bat guano deposits) in Alabama caves armed Confederate soldiers, while during Prohibition our caves housed illegal drinking establishments and gambling dens. One such infamous site,Bangor Cave in Blount County, was shut down by the local sheriff almost as soon as it opened in 1937—on the order of Alabama Governor Bibb Graves. The critters that inhabit Alabama caves are often a class unto themselves. From the Alabama Cave Shrimp—found nowhere else—to endangered salamanders and bats, cave species, like speleothems, must be protected from inexperienced spelunkers. Simply stepping in the wrong place—or visiting a bat hibernation cave at the wrong time of year—can endanger a whole species. So, when it comes to all things cave-related, rely on a knowledgeable caver. Visit the NSS office in Huntsville and attend a local Grotto meeting. You just might experience a world beneath your feet that you never knew existed. And you'll know better than to call a caver a spelunker!